Yesterday, I went to the Winter Market in Woodfin, North Carolina. It is inside the YMCA, where it’s warm and dry. (At 40 North Merrimon Avenue, Ste. 101 in the Reynolds Mountain Complex.) The Market is open on Saturday from 10:00 a.m. until noon. You better hurry because there are only two more Saturdays left in this particular winter! It will be worth the trip – there were a dozen vendors (farmers) there with a very practical array of products for shoppers. I managed to speak with a few of the farmers and bought several items to try, all of them good buys. Mudlucious Pottery and Gardens is a place I cannot wait to visit in person. They make pottery, raise chickens and bees, and sell the honey and and eggs. I like Cindy Trisler’s pottery a LOT. You can find them in Madison County. Lady Luck Flower Farm had buckets of beautiful tulips and tender mixed lettuces for sale. I purchased a bag of mixed lettuces from them, which were tender and delicious, not bitter. I checked out the web site and the farmers, Katie and Mike, raise beautiful flowers. You may pick your own, or order what you wish. Make sure you check out their photo gallery – the wedding flowers are gorgeous! Creasman Farms offered crates of beautiful, local Pink Lady apples, apple butter, and homemade apple muffins. The apples are smaller than your store bought apples, but the flavor is 5 times bigger. Those little apples pack some crunch and sweetness! The apple butter is dark and smooth, great with goat cheese. The muffin was quite tasty, big chunks of apple in it. (If I had tasted it before I gave half to my sister, I would not have shared.) They have several varieties on 35 acres and you can pick your own if you like. Paper Crane Farm was selling fresh, lightly peppery watercress. Yum! I will tell you about the salad I made for lunch yesterday in just a minute. The Pixie’s Pocket table held an impressive selection of flavored honeys. I of course chose one with chocolate in it. It’s called Mayan Chocolate Honey, and it tastes rich and dark, with just the right zing of hot pepper. The Head Pixie recommended serving it on top of goat cheese, in a strawberry. I think she is onto something, so it’s what we will have for breakfast today. Spinning Spider Creamery of Marshall, N.C., offered handmade goat cheeses. I tried four and liked them very well. 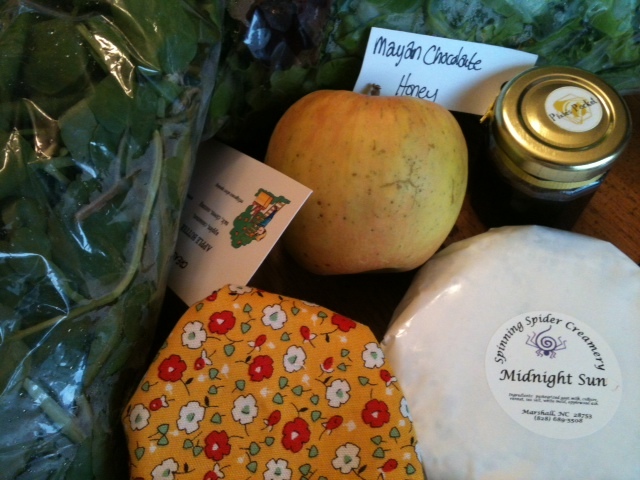 I came home with a garlic and dill chevre and Midnight Sun bloomy cheese in a little wheel. The flavors are not subtle, the textures are varied and lovely. East Fork Farm raises grass fed lamb, poultry (chicken and duck), and rabbits. Since I am all stocked up on meat at home, I did not purchase from East Fork, but you can bet I will! My hubby loves duck and we both love lamb. I cannot wait to try the rabbit! When I looked at the East Fork Farm web site, I noticed a pretty little cabin for rent. Hmmmm. There was a pasta vendor as well; she had a great selection of handmade pastas stuffed with all sorts of goodies, like mushrooms and cheeses. I will follow up with her next week, since we did not have opportunity to speak. When I got home, I made a salad of fresh tender lettuces, watercress, Pink Lady apples, goat cheese, pecans, strawberries, and topped it with a drizzle of dark chocolate balsamic vinegar. I sat on my front porch to eat my lunch, looked out at the blooming trees and mountains in the background, and found the glorious spring day just about perfect. I hope you will visit the Woodfin Y next Saturday. Check out the links to the right visit these farms at the markets listed on their sites, or check them out in person. Thank you Ms. Mental Farmer. We are glad to have you in WNC! Glad to be here! And may I say, strawberries stuffed with goat cheese and Mayan chocolate honey are a most excellent breakfast! Yay, I am glad you gave my recipe a try! *grin* “Decadence before noon!” is a good code to live by. I’m now following your blog. It was nice to meet you on Saturday! Decadence before noon… I like it!!! Yum – your salad sounds delicious and I’m glad you are finding some great places in NC for home-grown goodies! It was, actually. I just might do it again!